Megan Drake reports for Care2.com, that an Iowa woman named Kelly found a huge surprise as she pulled into her driveway. Her dog, Reagan, was sitting next to a crumpled Meow Mix bag. Reagan was known to bring “treasures” home for her but this was different. He whined incessantly at Kelly. So Kelly opened the bag and, to her horror, found two tiny three-week-old kittens covered in the viscera of their littermates. “What was painfully obvious to her was that these kittens were intentionally put in a bag and dumped on the road. It was also apparent that the bag had been run over and that at least two kittens, maybe more, had been crushed; and that her dog had retrieved the bag from the road and brought it up to the house for Kelly to find,” as described by Raccoon Valley Animal Sanctuary & Rescue (RVASR), the organization that eventually took these traumatized kitties in. Kelly reached in the bag and took the frightened kitties inside her home. She bathed, fed, and comforted the little critters. The next day she tried contacting various rescue organizations only to be told they could not help. Finally RVASR told her to take the kittens to their veterinary group and from there, found a foster mom experienced in neo-natal kitten care. 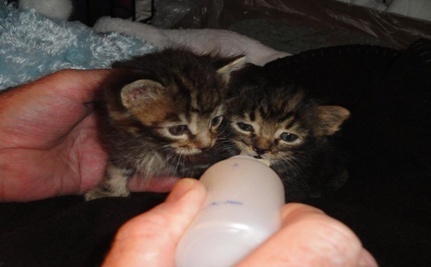 The two little boys, brown and cream tabby mixes, were named Skipper and Tipper. Skipper is curious and energetic and loves to snuggle before nap time. Tipper is a gentle, sweet and laid-back fellow – a consummate lap kitty. After many hours of dedicated around the clock care by the foster mom — including hand feeding every two hours — the little guys were ready for adoption. This entry was posted in Animal altruism, Animal heroism, Animals, God's creation. Bookmark the permalink.